Supply Bay is situated on the western bank of the Tamar River, approximately 30 minutes drive North of Launceston. The Supply River flows into Supply Bay, and is the site of Tasmania's oldest water driven flour mill (1825 -1888). The ruins of the mill are still standing today, and can be accessed by a walking track from the Supply River Bridge on the Deviot road between Gravelly Beach and Deviot. On the southern side of the bay nestles the hamlet of Paper Beach, the home of Supply Bay Design. Supply Bay Design creates a variety of items from old E.P.N.S. reclaimed cutlery. Twist rings, Wrap-around rings, Apostle rings and Cake fork rings. We also create ear rings, pendants, bracelets, candle holders and wind chimes from recycled cutlery, as well as horseshoe nail jewellery, musical instruments and a variety of saddlery items. 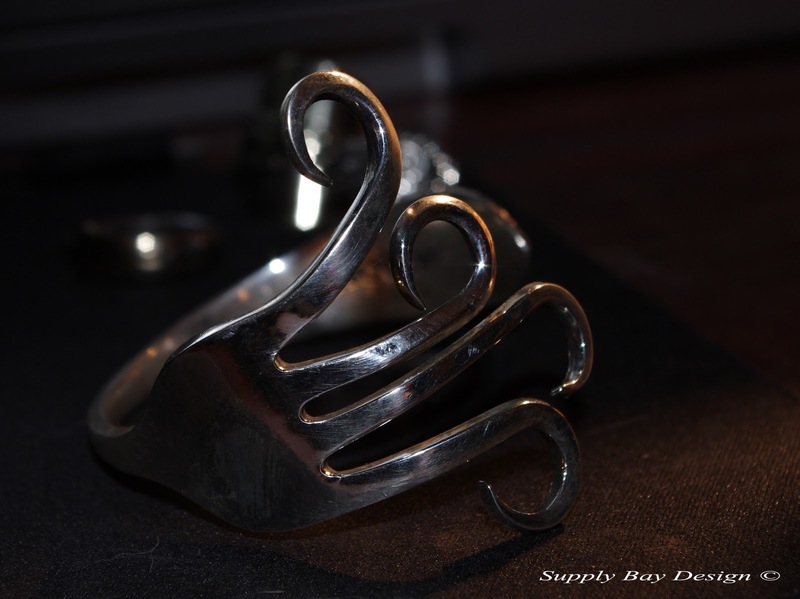 When you purchase a handcrafted spoon ring created by Supply Bay Design, you purchase a genuine piece of history and tradition which dates well back to the early 1600’s. Back in those days, servants who could ill afford a wedding ring, would resort to stealing silverware from their employer, and fashion it into a wedding ring for their beloved. It was a very serious crime to steal such an item back then, and if caught the culprit could expect a lengthy jail term….perhaps in later years, transportation to colonies such as Tasmania. Who knows where your ring came from, or who has used it in the past? Was it part of a gift set…..perhaps a wedding present? Was it used by a swaggy, wandering from station to station during the great depression, or the head chef in a famous restaurant? Or was it an old faithful spoon or fork that had been lying around the house for years, and finally used to dish out tucker for the family pet before being finally thrown out when a replacement was found? What we do know, is that we get a great deal of satisfaction hunting through piles of recycled goods to seek out these items….then fashioning them into collectible items that once again sparkle in the sunlight, to be admired by many. Every ring or other cutlery item we create is unique. We don’t use molds, or electroplating to fashion our items, as that would destroy the character and each item is individually crafted by hand. markings would destroy its very soul. 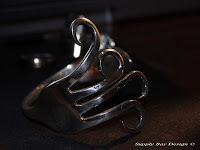 When you purchase a spoon or fork ring from Supply Bay Design, you not only buy a piece of history and tradition, but most of all you buy a mystery and an untold story from the past. \We hope you enjoy your Supply Bay Design article as much as we have enjoyed creating it for you. Great. When next in Tas will seek you out. gday honky, i hope everything goes ok with your problem from a few years ago. Supply Bay Design. Awesome Inc. theme. Powered by Blogger.